The Sarafan Lord was still accumulating his power, and to dispose of the noble family publicly would have been a political disaster. He ordered the Sarafan Darktroopers, a secret regiment of the Sarafan Elite, to kidnap Umah and bring her to him in The Device. Demanding to know the location of the vampire rebellion, the Sarafan Lord attempted to torture the information out of her, but her will was strong and she resisted. A suggestion from the Vamperor proved much more effective though. Bringing her to the Device control room, he stated that if she does not divulge the location of the rebel base, then he would test The Device’s destructive capabilities on her family’s mansion. She begged for their lives, before finally giving the lie that the base was located on Datooine Street. The Sarafan Lord ordered his men to continue with the operation, and Umah watched in horror as The Device directed a burst of energy into her family’s mansion. Though the mansion was not structurally damaged, every living thing within was killed. The Sarafan Lord was pleased with the demonstration; certain that upon completion The Device was going to be very destructive indeed. He thanked Umah, before raising his blade and impaling her through the torso. She died. She awoke days later in the heart of The Cabal. The second Vorador soothed her, explaining that they found her body floating in the Meridian river. As a way of repaying her late stepfather for all of his help to them, they revived her as a vampire. Umah adjusted quickly, learning new skills and gifts, and rising in status and prestige. A century later, the situation had deteriorated dramatically. The Sarafan Empire controlled almost everything, the humans and vampires of Meridian were oppressed under the harsh dictatorship of the Sarafan Lord. Dissent and opposition were eliminated, and the Sarafan ruled through a doctrine of fear. The second Vorador, in an acknowledgement of the grimness of the situation, confided in Umah, now his most trusted lieutenant, that there is still one small hope. In the deepest crypt of The Cabal, lay the body of the legendary warrior Kain, asleep now for more than a century. If Kain ever woke, he could perhaps achieve what Vorador and his underlings could not, and destroy the Sarafan Lord. As a different species of vampire, Necromatic, as Vorador explained to her, he had abilities they did not possess, such as a power to disguise his presence. Vorador ordered Umah to take his body far away, should the Sarafan ever discover the rebel vampire base, they would surely destroy him. She did so, and feeding him scraps of blood for years, Kain eventually recovered. Umah guided him, became a friend to him, and directed him on his quests to seek out and destroy the Sarafan Lord, and his Device. But as Kain once again grew in strength, Umah realised that he was nearly as dangerous as the being they were trying to destroy. 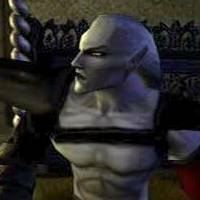 Kain was young, powerful and arrogant, and saw the world as being his own. Unable to change his ways, Umah grabbed the Nexus Stone from him, a trinket of great power, and attempted to seek out and destroy the Sarafan Lord herself. She never made it. 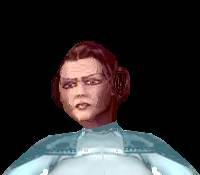 Attempting to commandeer an Imperial Sarafan Destroyer to sail to the ancient Hylden City, she was caught by the Sarafan Darktroopers. She killed many, but not enough and the loss of blood became too much. Collapsing on a pier next to the sea, she was discovered by Kain who effortlessly murdered the last of the Darktroopers. Umah begged for some blood, but Kain was convinced that like so many others, she was a servant to the Sarafan Lord. Regretting every moment of it, but convinced of the necessity, Kain ripped a gash in Umah’s throat and let her die. 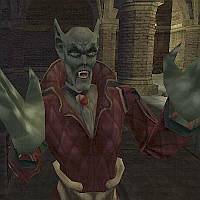 As Kain discovered in his confrontation with the Sarafan Lord though, Umah was no spy for him. Kain regretted his action, unable to see that someone opposed to the Sarafan Lord may be opposed to him too. Never one to dwell on the past though, Kain buried his feelings of regret deep down. Unknown to the young vampire, Umah’s body had been taken to the laboratories of the Super Sarafan Destroyer for analysis. 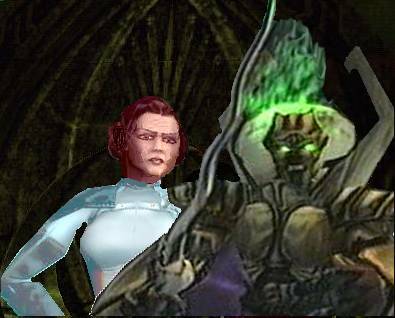 When the massive ship follows Kain back in time at the beginning of Legacy of Turelzevir: Doll Reaver™, the Sarafan Lord orders his scientists to repair Umah’s injuries and pump blood back into her veins, reviving her. Umah is to be the bait to lure Kain and his allies into the Super Sarafan Destroyer.